Looking for ways to help your preschooler explore their world? Toddlers are natural explorers and love learning about the world around them. Sensory bins like this construction bean box are a great way to encourage learning and will keep your little ones engaged while developing new skills. They are super easy to make and budget friendly too. Don’t be afraid to let your little ones get messy! I also purchased some new construction vehicles to create our “dumping and pouring” sensory bin. Two toddlers can play comfortably with the size of this bin and when play is over the bin slides under the bed for perfect storage. 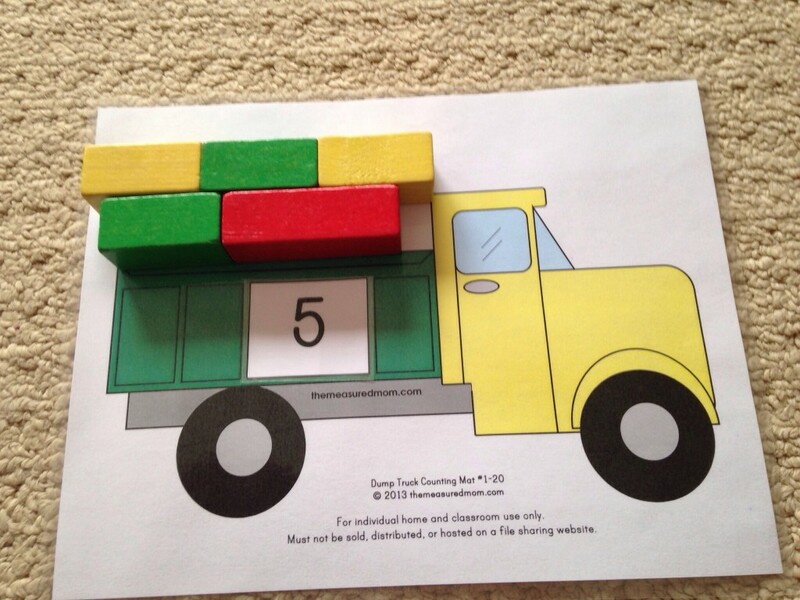 I also found this great Math manipulative over at the measured mom (And it’s free too!!) which we used to extend our play. We used wooden blocks but you could use play dough or buttons. Do your kids enjoy sensory tubs? What would you add to our Construction Bean Box? I would love it if you added your ideas down in the comments below. Such a great idea! I love this and have to replicate it! Sensory boxes are such great educational tools. I love your homemade idea. What a great idea!!!! 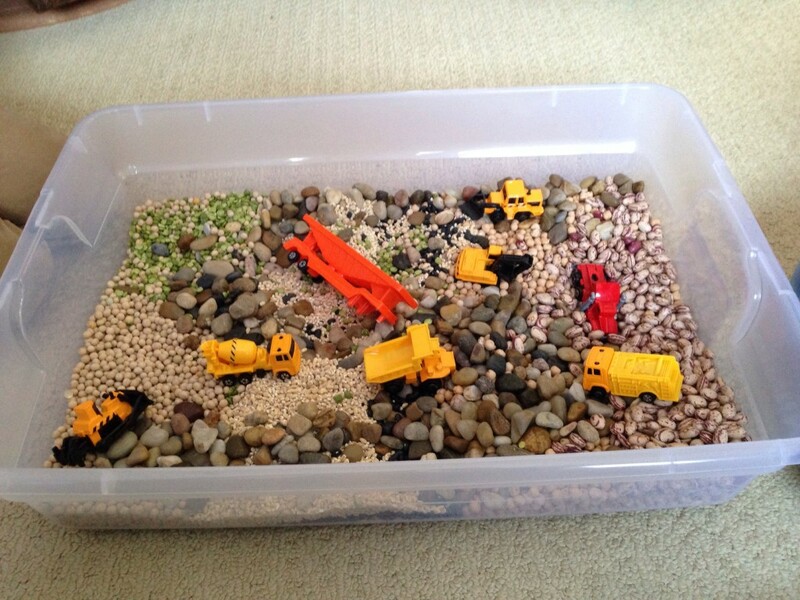 Great activities, we do a lot of sensory bins also and beans are an awesome filler for sensory boxes! I’ve never heard of sensory tubs before but it looks pretty cool. we’ll have to make one of our own. Great ways to learn…The 5 truck is a great idea. Perfect for Davey he is a truck nut! i used to do sensory boxes with my kids for the seasons, and also with classroom when i taught in preschools. they are so awesome. they are also a wonderful thing to pull out when it’s too gross to play outside! The sensory box is great! It would be so great for boys or it could be changed up for girls! Actually it’s funny you mentioned that. My daughters spend more time playing in this sensory box then my son does! Yes, we will jump in leaves again this year! We have tons each year, algohuth none yet as it still feels like summer here in Houston no leaves dropping yet. I will have to invite some friends to enjoy our leaves with us, our friends who don’t have mature trees like we do. I love this simple pleasure of the season! I really love that sensory bin. Definitely going to give it a try with my little boy, he is beyond bored with it being so cold outside! I had never heard of this, either, but it is a great idea. I love the idea that it is hands-on and then closed up and put under the bed! Shame on me, I didn’t even know what a sensory bin was until I read this post. 🙁 On the up side, I let them play with all kinds of stuff when they were little so I guess our house was just one big sensory bin! My kids used to have a sand and water bin they absolutely loved. I put a sheet under it and let them play as long as they wanted. That’s a great idea, especially when kids cannot play outside and are stuck with usually a few items. Bringing in a box with plenty of different items is also in a small way recreating the outdoors experience. I think my toddler would love something like this! Thanks for this idea! I love the things you selected for the sensory box. I think it’s a great idea for toddlers. My little guy had some sensory issues when he was younger and LOVED playing in rice. I think if I gave him a box of it, he could still sit and play in it for hours. I love your truck sensory box with all the rocks. That is a cute idea! My daughter would have gotten a kick out of that when she was little. That is a good idea for young children to get through sensory issues. Also for teaching them the texture and feel of different objects!